Note: There were few differences between the Remastered and Perfect editions, so for the sake of simplicity, I will only discuss the Perfect version when there are changes. Also, I didn’t bother to point out non-substantive changes, such as Ami’s name being changed throughout from hiragana (あみ) to kanji (亜美) in the transition between the Original and Remastered, as well as changed or rewritten sound effects. There are also many cases where the under-eye makeup is made slightly more emphasized for the Sailor Team, but the change is so small that I often omit it. 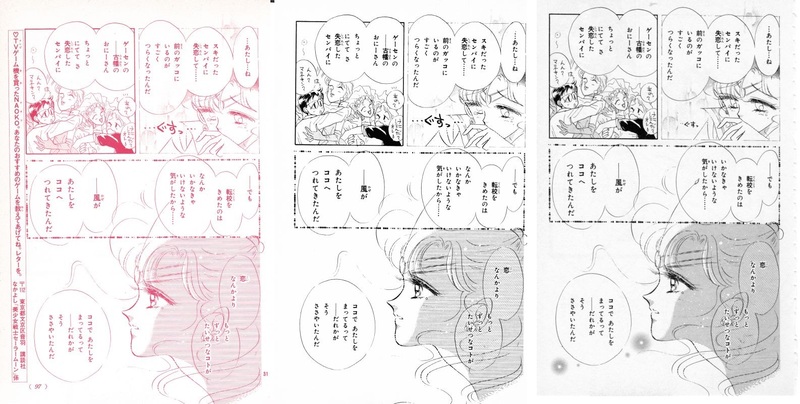 Since Naoko no longer needed the space at the bottom to add in the “Last Time on Sailor Moon…” section, the panels were moved down slight and extended a bit, though there weren’t many changes. In the Original release, some dots were added around Usagi’s hands in the right-hand panel to suggest a glow, and in the top-right a leaf border has been added rather than just leaving it text in an empty space. From the Remastered edition, we get some glow-balls – Naoko’s favorite! – added throughout and some text moved, but no substantial changes. Oh well! Pretty minor changes here, but only a background added to the lower-left panel with the Original version. Once we get to the Remastered, unsurprisingly we get a touched-up Luna in the top panel, and Luna’s face has been cleaned up in the lower-left. Next! That… chin in the top-right. I’m not usually a fan of square-jawed characters, but Mamoru really needs to get that sorted out. So in the Original, Tuxedo Chin gets some background art in the top-right, and some of the lines are removed in the Remastered. 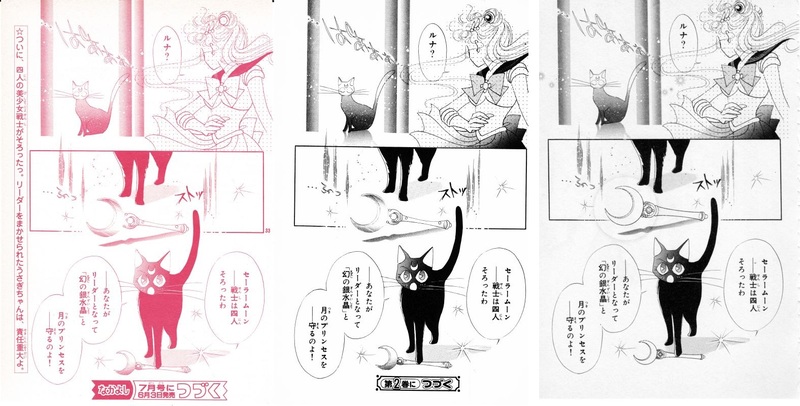 I think Usagi’s make-up is ever-so-slightly adjusted in the middle panel, but only barely. I’m starting to think that Naoko’s motivation was waning the further she made it into Volume 1, both in the Original and Remastered releases. 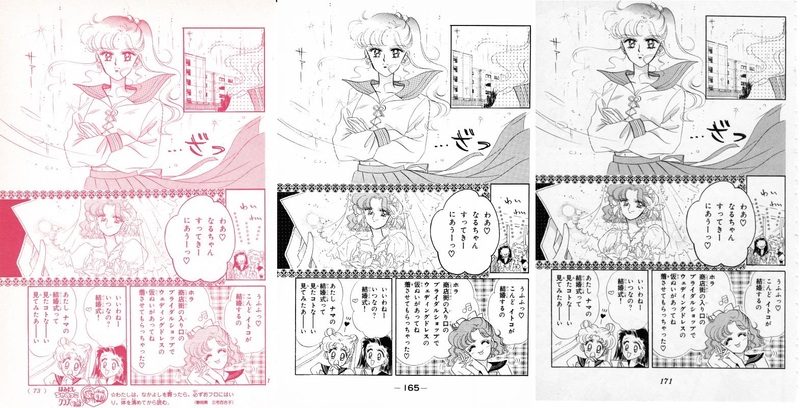 The only changes on this page that I can see are an adjustment to Luna’s face in the top-center panel as well as slight changes to Usagi and Makoto’s makeup at the bottom, all in the Remastered edition. 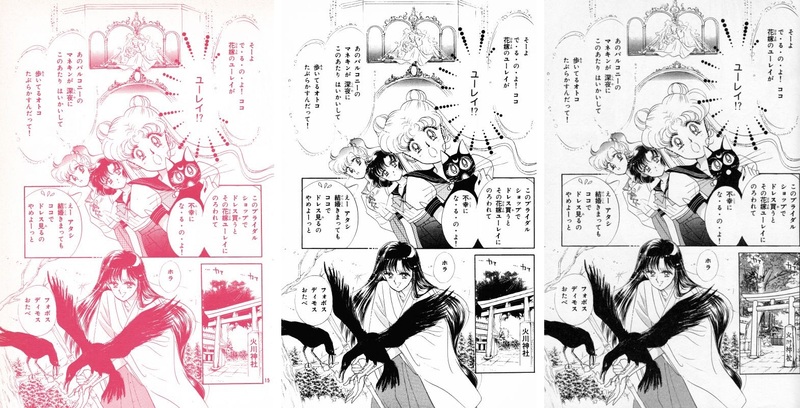 Starting with the Original, Naoko kindly added a background to the middle-right panel (with Usagi and her friend), drew-in some ruffles to Wedding Dress Naru’s sleeves along with some flowers to her hair in the left-hand panel, and put a heart above Usagi’s head in the lower-left panel. Once we hit the Remastered edition, Naru gets some further touch-ups in the left-hand panel, with her sleeves being slightly redrawn and her hair adjusted to give it some more volume. 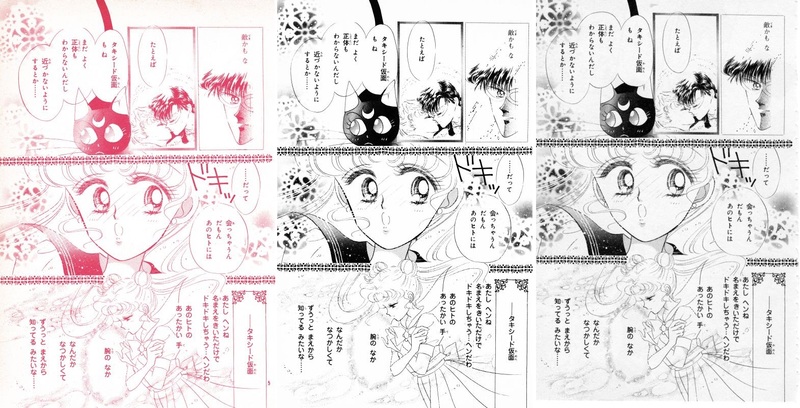 At the bottom-left, Usagi’s right odango has been redrawn to make it more round and her bangs filled out. 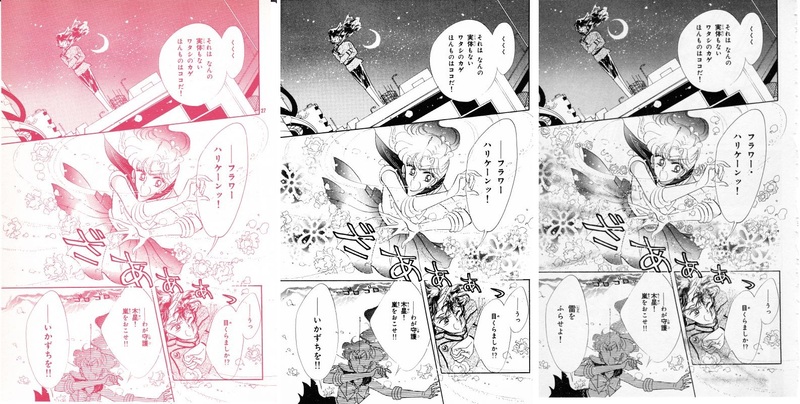 The Original introduces a few small design changes, specifically the girls’ skirts have been colored in black in the top panel, a screentone added over the background of the middle panel, and some sunflowers added to the speech bubble in the bottom. 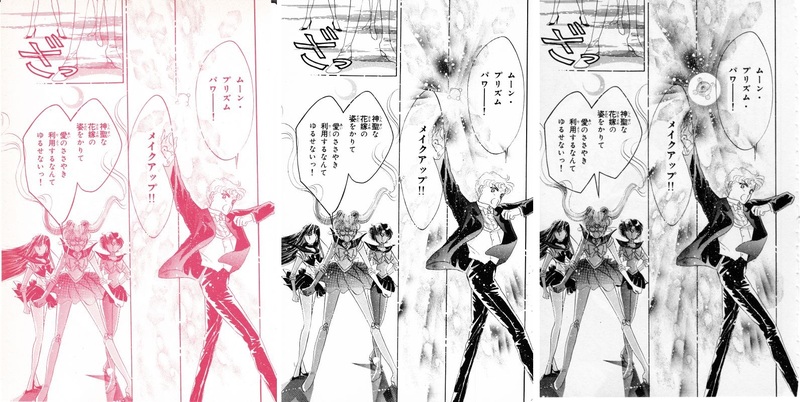 In the Remastered, Usagi’s bangs have been filled out (on the right-hand side) in the bottom panel, and perhaps a runner-up for the most pointless edit ever, some lines have been added to her odango in the lower-left. 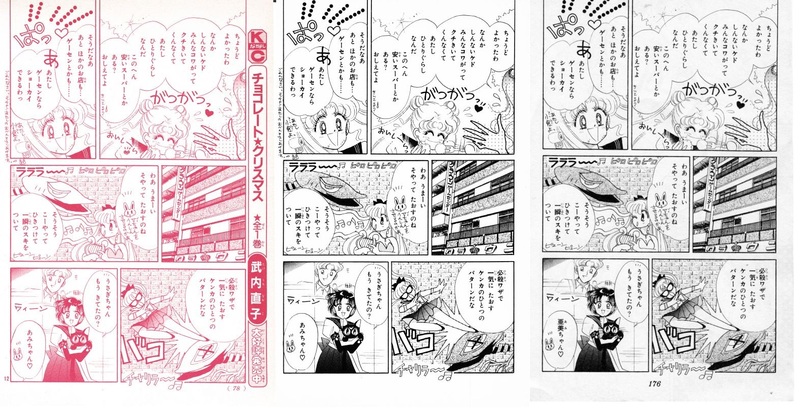 I’m actually not finding any changes on this page, with the exception of the removal in the Remastered edition of a small author’s note next to the lower-right panel, where Naoko explains to her young readers that this 天パー (tempaa) Makoto is talking about is short for 天然パーマ (ten’nen paama; natural perm). I’m going to be completely honest – I was really, really hoping that Makoto’s lunch would get redrawn over one of the iterations. Sadly, no luck. In the Original, a background is drawn behind Usagi and Naru in the top-center panel and Usagi’s musical note is colored in to the top-left. From the Remastered, Usagi gets a much-needed odango in the top-left, some more kids are added playing baseball in the middle-left panel, and some of our favorite glow-balls have been added to the bottom-right. Yay for glow-balls! 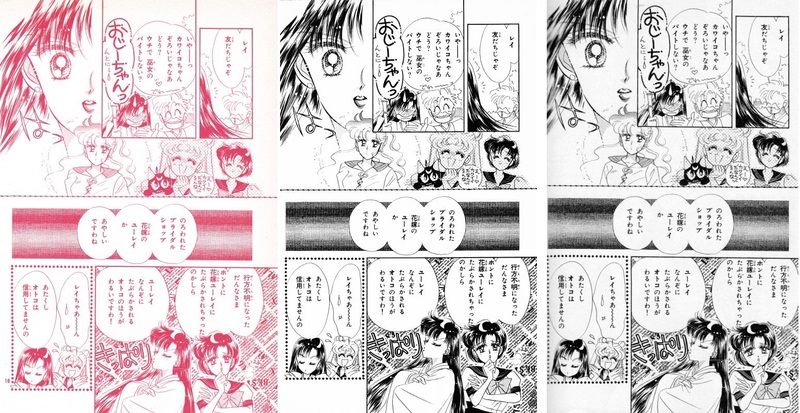 In the lower-middle panel (where Makoto is offering up her lunch), a screentone has been added over Makoto in the Original version, and once we get to the Remastered edition, some movement lines are added above Usagi’s odango and she gets some bang-ier bangs in the same lower-middle panel. 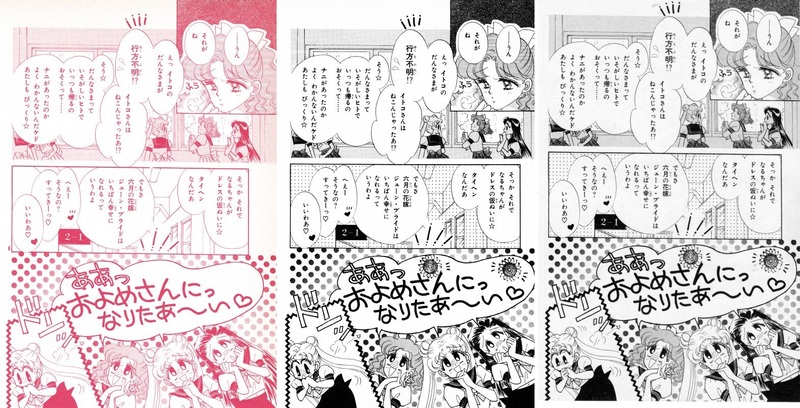 To the lower-left, Usagi’s school blouse is redrawn slightly and the tiny Makoto head has had her hair colored in. 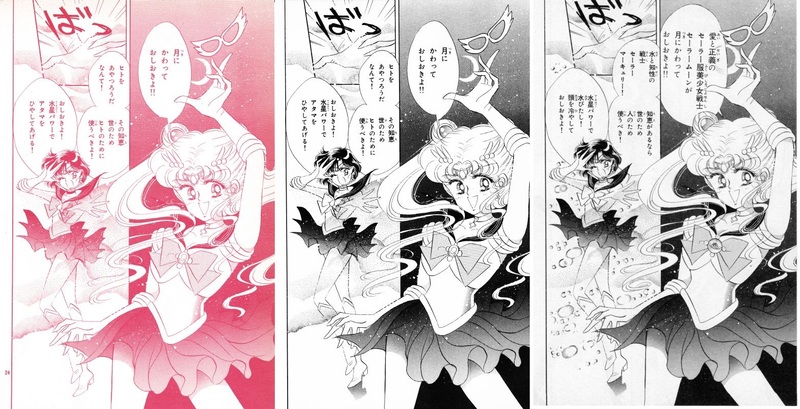 Is it just me, or does the Sailor V game seem to change in every single issue? It’s almost like Naoko really wasn’t sure what kind of game she wanted it to be, and just drew whatever sounded fun at the time. I’m so sorry! Listen, you can have my lunch! Seems kinda sad to get rid of this note, since Usagi’s offering to let Makoto eat her own lunch that Ikuko made. 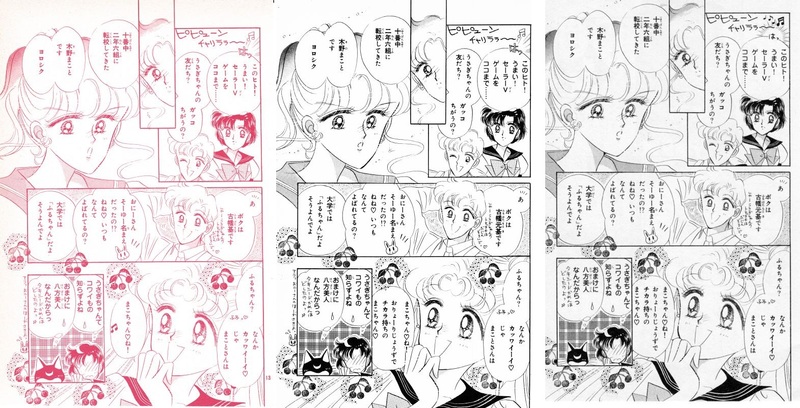 Finally, in the bottom-left, Ami gets some more volume to her hair, and Luna’s face is touched up. You’re Mako-chan, then! Mako-chan – she’s good at cooking, and strong too! In reference to her love for all the cute men around her. Wow, this page changed quite a bit from its original design. So much so that I doubt I really even need to point it out. The bridal shop that they go to has been completely redrawn in the Remastered edition in the top and bottom panels, and in the middle-right panel the decorative arch below the window has been removed. The reason for this is because the building is in fact the very Yumi Katsura Bridal Salon, so I imagine they wanted to clean that up. Also in the Remastered, the background building in the top panel is redrawn, and the decorative arch is again removed in the top-left. Ah well! Let’s talk about the pink elephant in the room first – those crows are really ugly. And they never get better. Okay, good, that’s done. Changes to this page start in the Remastered version, and include changes to Luna’s face (shock!! 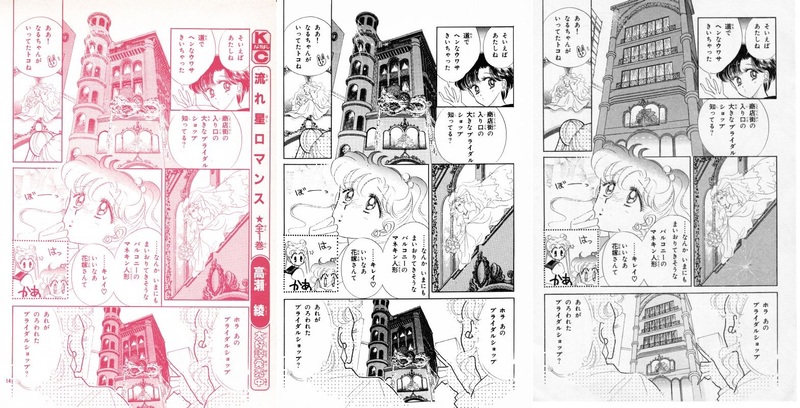 ), Usagi’s bangier bangs, a left odango adjustment, more makeup under her eye, Usagi’s right-side shirt sleeve is less poofy, and the building in the background is adjusted, including a less decorative arch (all in the top panel). 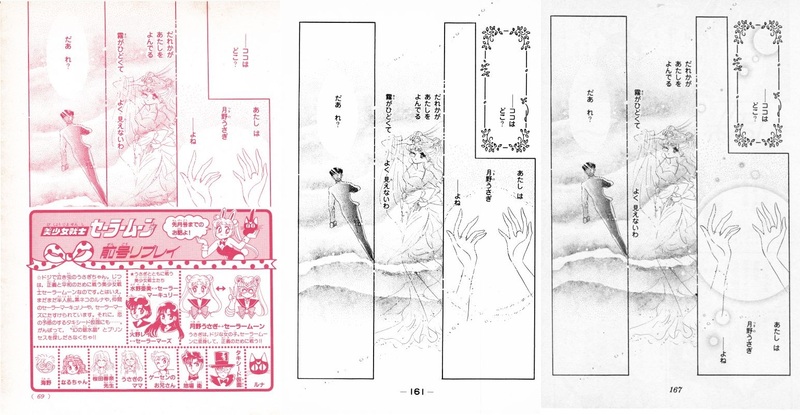 In the lower-right panel, the Hikawa shrine panel has been entirely redrawn. 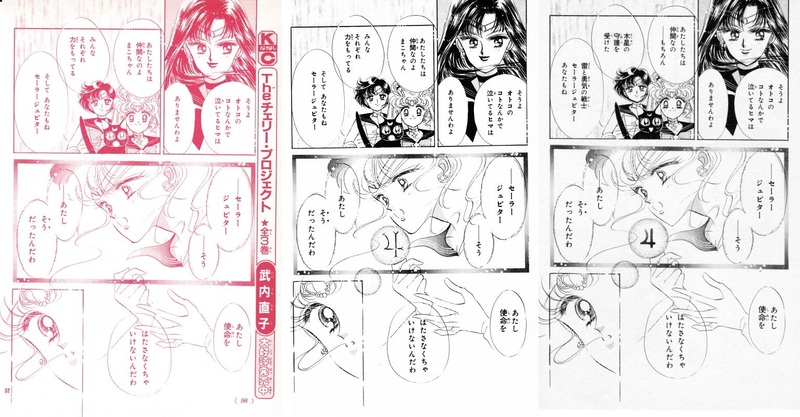 Just a few small changes in the Remastered version, and those would be Makoto’s arms are redrawn in the top panel, Rei’s makeup redone, Ami’s sleeve have some ruffles added on the right side in the lower-right panel, and in the lower-left panel more of Usagi’s arms and drawn and her bangs grow. it… looks like her ears are a bit lower? So now we can see the bridal salon from the inside and, surprisingly, it looks like Naoko didn’t feel like many revisions were needed. You can even see that the decorative border above the window was left intact. However, it looks like a window (and some… banner, hanging from the roof?) has been removed in the Remastered. Also, in the lower-left panel, a sort of… water-color? Cloud of evil? A design is added behind the text. Lastly… hey, is that Endo talking to Motoki? You know, who brainwashed Mamoru brutally murders later on and we never hear from again? Weird, I thought he only existed to die. It always amazes me that this panel was never “fixed” or otherwise altered, seeing as how Makoto is clearly buying from an Asahi Beer vending machine. She’s clearly getting ready for a long night of… studying. Yes, studying. 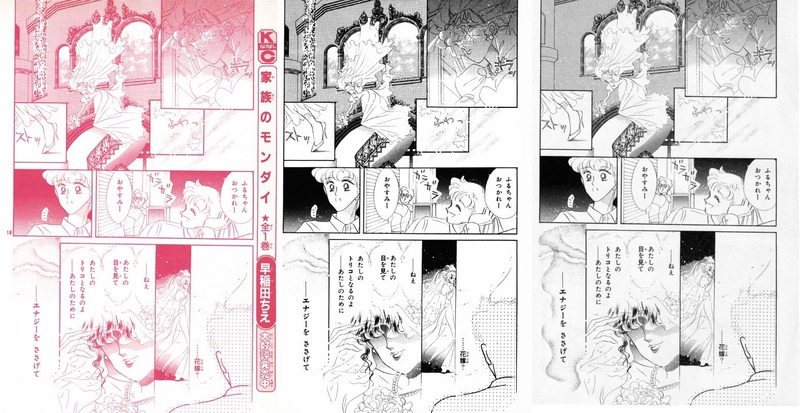 Anyway, almost no changes to this page, except one thing in the remastered: in the bottom panel with a closeup on Mamoru closing his book (and probably thinking about murdering Endo at some time in the future), the bottom of the panel has now been added to clean up the page layout. Also, Makoto stuttered in the middle-right panel, but that’s a non-content text change. So, umm… how long do you think Tuxedo Mask was watching her in the window before Usagi woke up? And am I the only one who finds this creepy? More importantly, look at Usagi go! 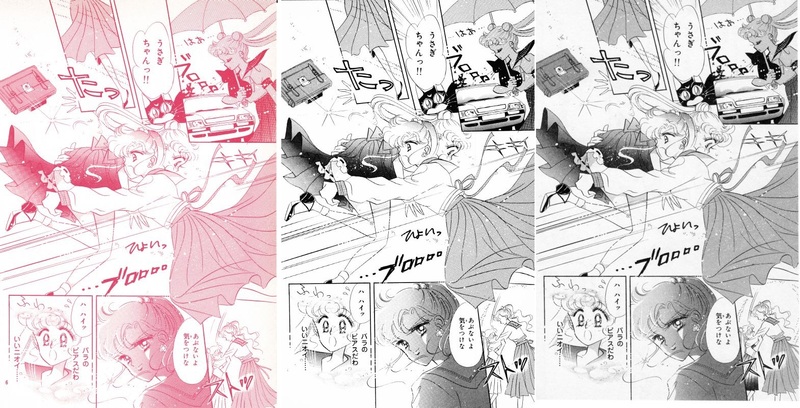 Not even henshin’s as Sailor Moon and she still dives out the second-story window and chases after him! You go, girl. Minor changes here. In the Original, shading is added to Usagi’s huge window sill and under Tuxedo Mask. Also, the ruffles on Usagi’s pajama collar get cleaned up. 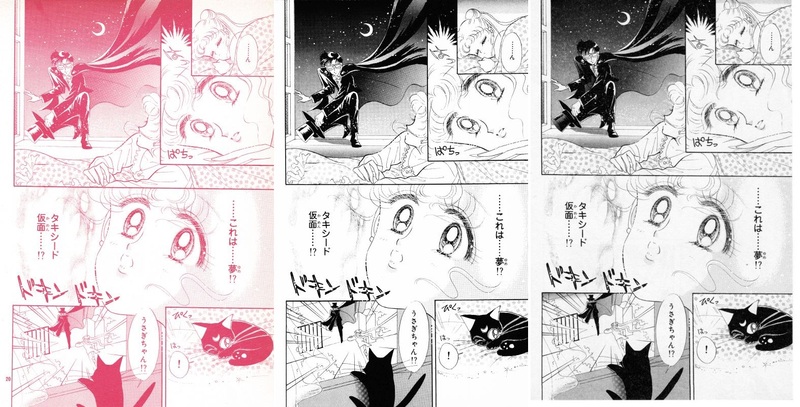 In the Remastered edition, Usagi’s hair has a few more detailed lines added to it in the top-right, her eye makeup is made more extreme in the top-right and middle panels, and Tuxedo Mask has had a lot of the light-source reflection spots colored in black. Surprisingly, no changes to Luna! 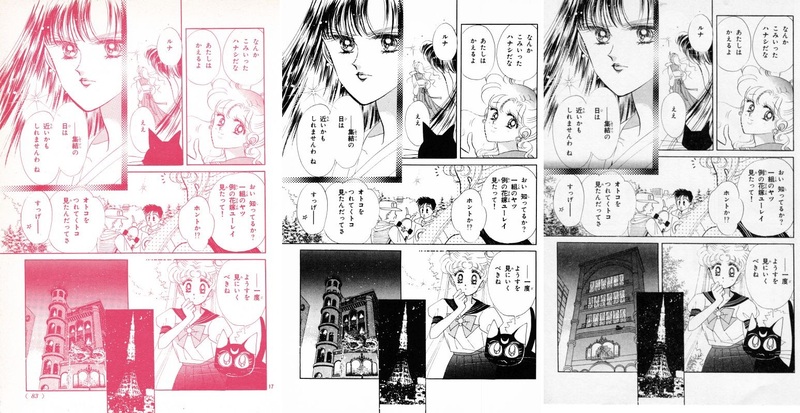 In the Remastered version, Luna is redrawn in both the top- and bottom-right panels – and that’s a good thing, too, since she didn’t have eyes before! 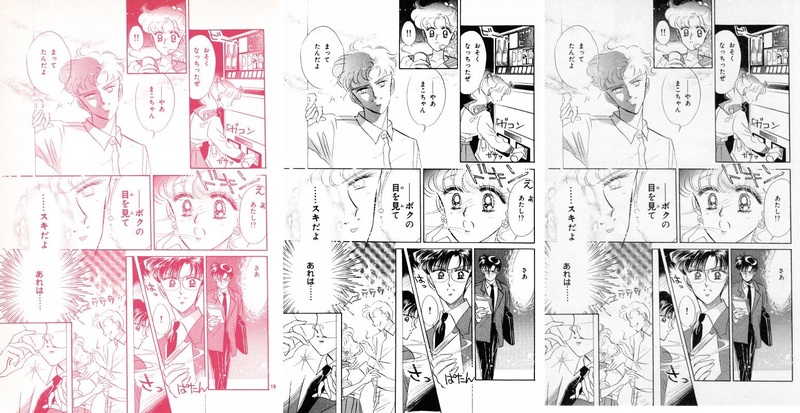 Also in the bototm-right panel, the rest of Rei and Ami’s clothes are drawn in. Finally, that dark spraypaint effect is added to the top of the panel with the ghost bride. Become my slaves and give up your energy for those under my command! Give yourselves up to my mannequins and sacrifice yourself to those under my command! I’m guessing that they wanted to avoid the “slave” comment here? Otherwise, it’s a weird edit. 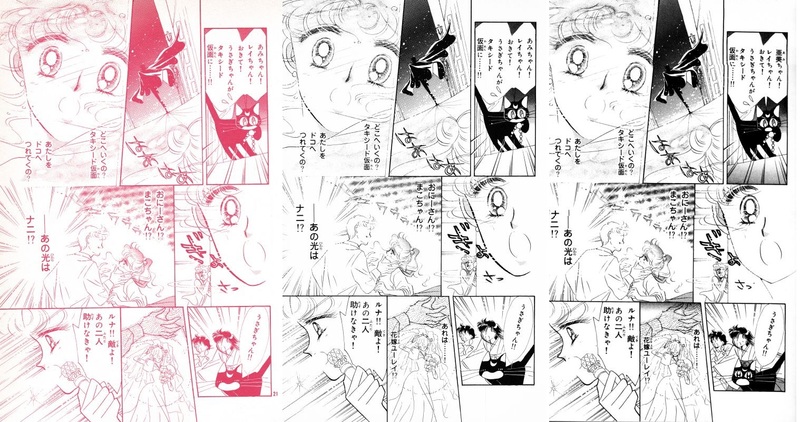 Read also: Did Sailor Moon Director Kunihiko Ikuhara Hate Naoko Takeuchi? 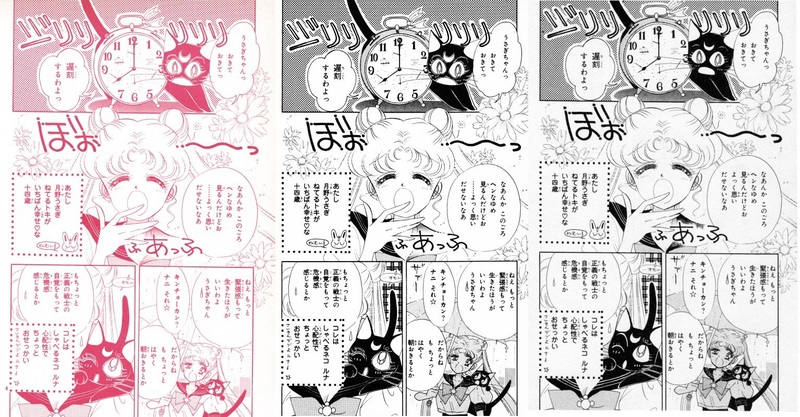 Also in the Original, a dark screentone was added to the top of the top-middle panel and, in the Remastered edition, the checkerboard pattern is more pronounced behind Tuxedo Usagi. Finally, the rabbit image in the lower-right bubble is redrawn. One note here: I wonder if Sailor Moon still technically has white boots at this point in time (before the story settled on her red boots). Probably red, but something about the shading here is iffy to me. Anyway, small change in the Original release, but some extra shading/effects were added around the brooch during the transformation. Moving into the Remastered edition, we get the… umm, super ugly brooch redraw? And that’s about it! Wow, lots to talk about here in the Remastered edition! I, sailor-suited pretty soldier of love and justice, Sailor Moon, will punish you in the name of the moon! Trying to manipulate people is unforgivable! You should use that knowledge for the good of the world and the people! I will punish you. With the power of Mercury, I will cool your head! The soldier of water and intellect, I am Sailor Mercury! Your knowledge should be used for the good of the world and the people! With the power of Mercury, I will submerge you! Cool your head and face your punishment! All rough translations, of course! 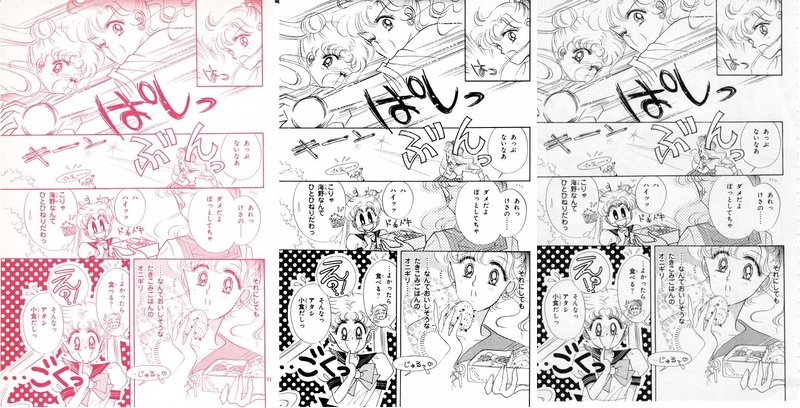 In the Original, we’ve got one small edit to the top-left, with the Jupiter symbol being added to Makoto’s forehead (something that wasn’t done with any of the senshi until the Original release). 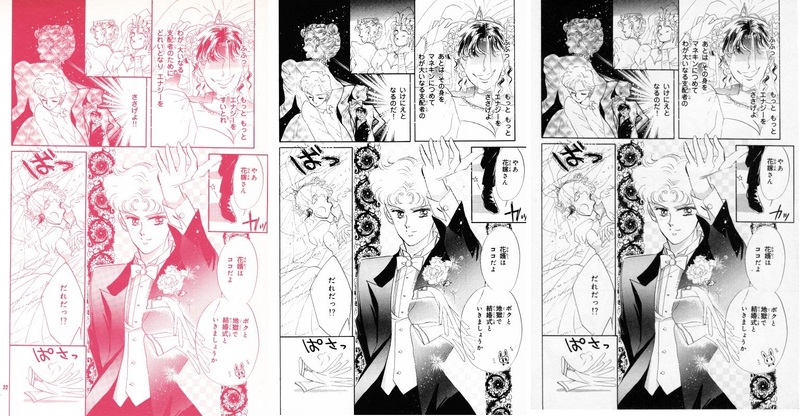 Once we make it to the Remastered edition, that Jupiter symbol is edited (poorly…), some flame effects are added under Mars in the right panel, some lightening is done to Makoto’s hair at the top, and in the bottom-left panel, Makoto’s collar and hair are defined a bit better. Sailor Mars also gets some slight edits, with her back bow being colored in, and Naoko added in the jewel to her waist, that was forgotten before. Trying to trick women? Don’t underestimate us! By the power of Mars, I will show you what the fire of fury! The soldier of fire and passion, I am Sailor Mars! Don’t underestimate women! By the power of Mars, I will incinerate you! And Makoto also gets a small rewrite in the top left from “You tricked me?” (だましたの？; damashita no) to “Damn…” (チクショウ; chikushou). You would dare trample on a girl’s pure heart?! I will show you the power of a girl’s pure heart!! 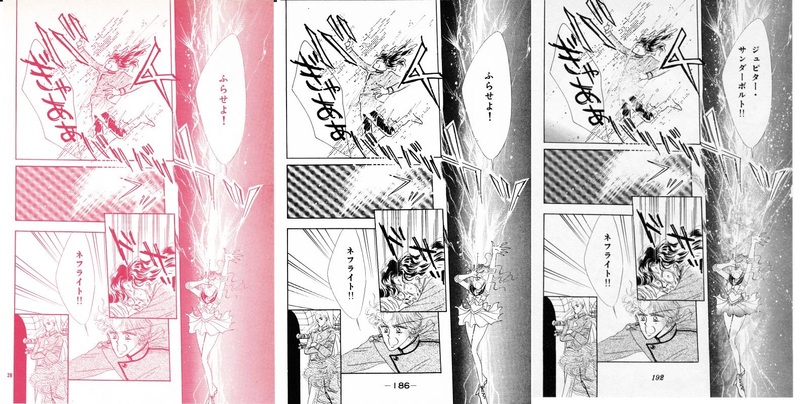 In the Original release, Makoto’s hand, face, and Jupiter symbol are added to the lower-right behind the henshin stick, to make it clearer that she grabbed it. Also, some stars are added behind her feet when she transforms into Sailor Jupiter. 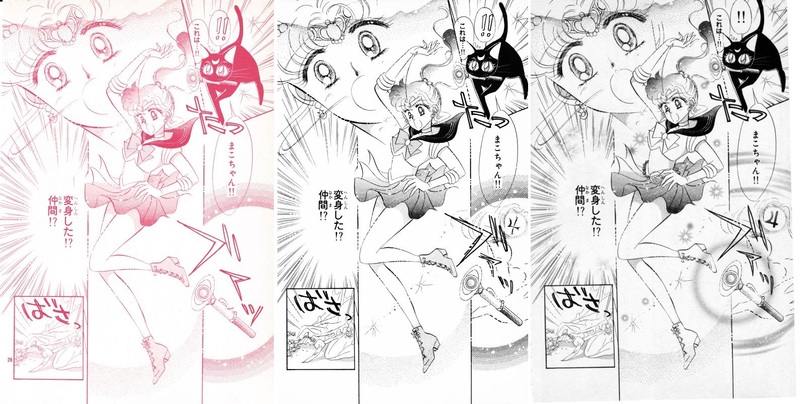 With the Remastered edition, Luna was redrawn in the top-right, the Jupiter symbol and transformation effects were changed on the right, glowy star things were added behind Jupiter in her transformation, and – probably most importantly – her belt with potpourri ball have now been added in. For some odd reason, the shading on Makoto’s boots was removed. Yay Nephrite! Time to… well, die. At the hands of flowers. Lots of people often forget the Sailor Jupiter’s first attack ever in the series was, in fact, Flower Hurricane. But I’m sure none of you people did, right? 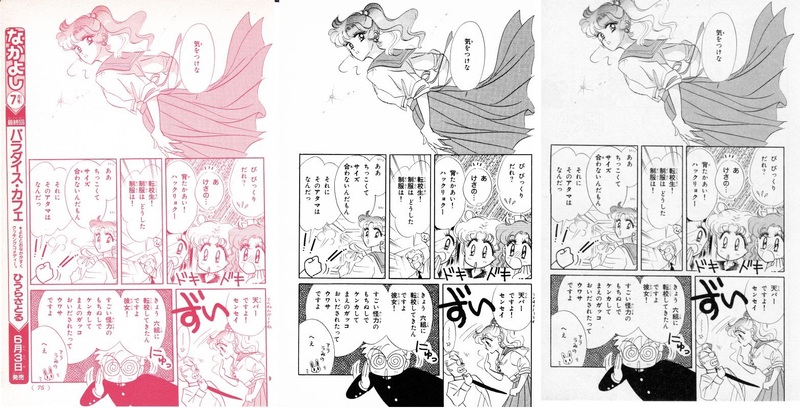 One small change in the Original edition, and that’s with Sailor Jupiter in the middle panel. More flowers were added to the background behind her. First off… text-changes in the right panel, see the previous page. Otherwise, the only notable change on this page is to Jupiter in the right panel, where she now has a potpourri belt and more extreme (supreme?) lightning behind her. Surprisingly very few changes to this page. 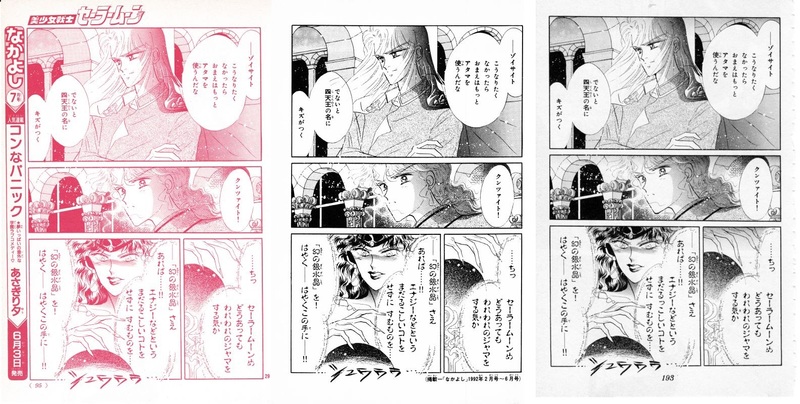 Naoko even forgot to lay on her heavy MSPaint spraypaint effect and add black borders to all the Dark Kingdom panels! The only changes are in the Remastered, and are limited to basically Beryl’s hand looking slight more wrinkly and old in the lower-right panel, and some shading added to the top of that panel. Wow… that was a good looking Luna, even going all the way back to the Nakayoshi release! 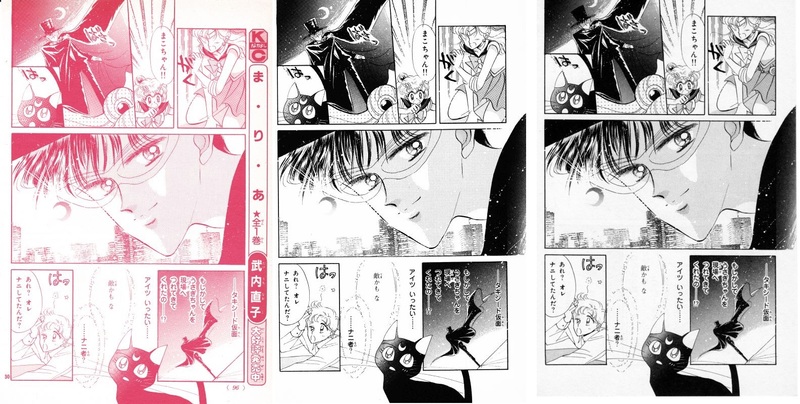 In fact, it was so good looking that the only revisions are to Sailor Jupiter in the top right getting her potpourri belt and Tuxedo Mask’s top hat getting filled in to the top-left, both of which happened from the Remastered. Not much in the way of changes here either. In the top-right, Sailor Jupiter’s rose earring is made a bit smaller and adjusted, and some background decorations are added to the bottom panel. Starting with the Original edition, the Jupiter symbol is added in, along with some nice… bubble effects? Once we move into the Remastered release, the Jupiter symbol is redrawn. Also of note, Mars’ face gets an update in the top-right (specifically, her lipstick is removed) and Luna gets updated again in the top-left. We’re all friends, Mako-chan. Everyone has their own powers. And you, you’re Sailor Jupiter! We’re all friends. And of course you, granted the protection of Jupiter, the soldier of lightning and bravery, you are our friend too Sailor Jupiter. 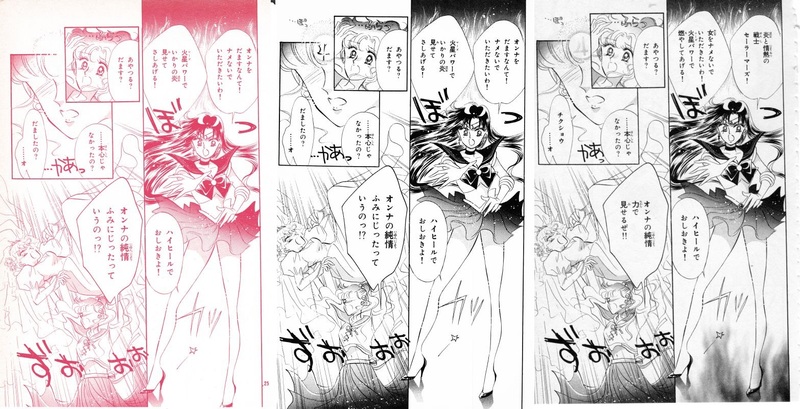 Changes to the Original release were minor – just coloring in Sailor Moon’s odango jewel and adding shade to her skirt. In the Remastered release, some glowing starbursts are added behind Luna, a glow effect is added around the Moon Stick, and the Moon Stick has been redrawn slightly in both shots. 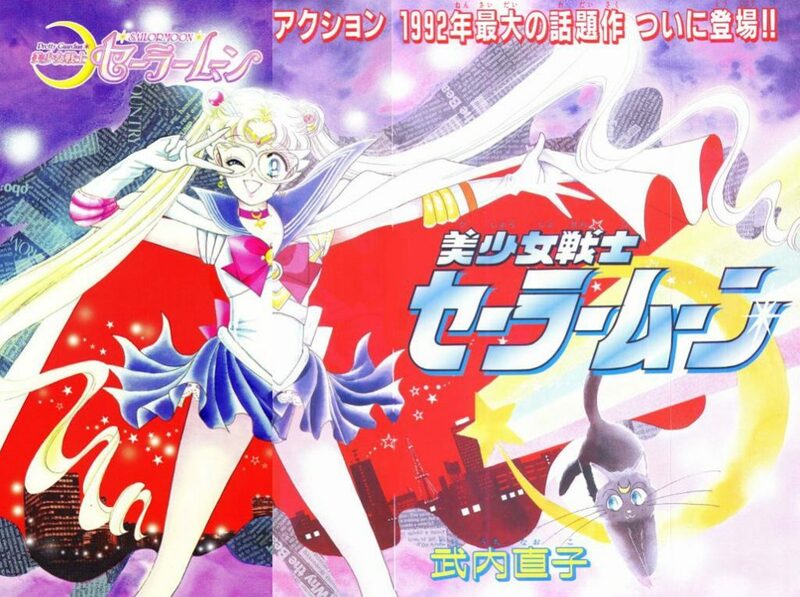 And that concludes my review of Act 5, the fifth chapter and final chapter in the first Sailor Moon tankobon release. I hope you enjoyed it! ← 11 Questions on My Sailor Moon Favorites!